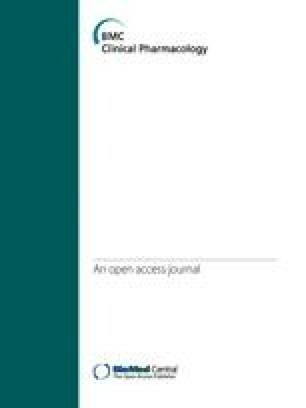 The online version of this article (doi: 10.1186/1472-6904-11-18) contains supplementary material, which is available to authorized users. Antimicrobial resistance (AMR) is a worldwide problem preferentially affecting low- and middle income countries [1, 2]. Two main contributing factors are (i) excessive use of antimicrobials (AMs) adding to an increased selection pressure and (ii) insufficient infection control policies favouring the spread of resistant microorganisms . Patients who receive AMs have an increased risk of acquiring infection from resistant microorganisms  and such infections may be associated with increased mortality and morbidity [5, 6]. Reduction in AM use is a cornerstone in the containment of AMR and can be addressed through changes in prescribing behaviour. Therefore, knowledge about the driving forces behind AM prescription is needed, and such information can be obtained by means of so-called KAP-surveys (knowledge, attitudes and practice surveys). KAP-surveys about antimicrobial resistance have been conducted among medical doctors in the community setting, but at the time of submission, only five have been reported from the hospital setting, including only one from a middle-income country [7, 8, 9, 10, 11] (Table 1). The awareness of AMR as a worldwide and national problem was very high among the participants. 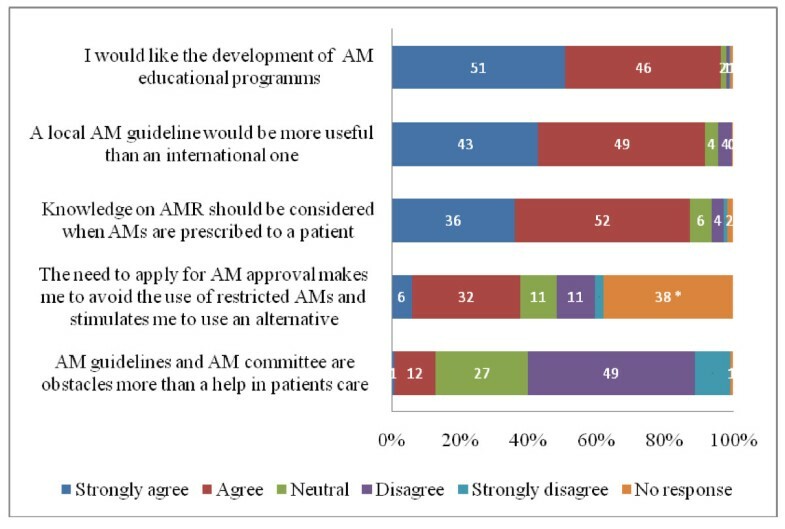 However, in contrast, AMR was much less recognised as a problem in participants' own practice. 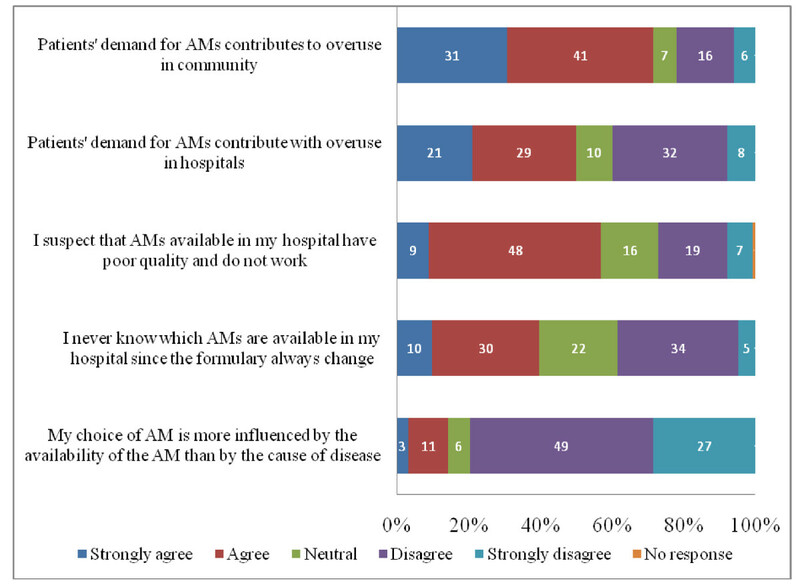 This trend has also been observed among physicians surveyed in the U.S. (Table 1) [9, 10, 11]. 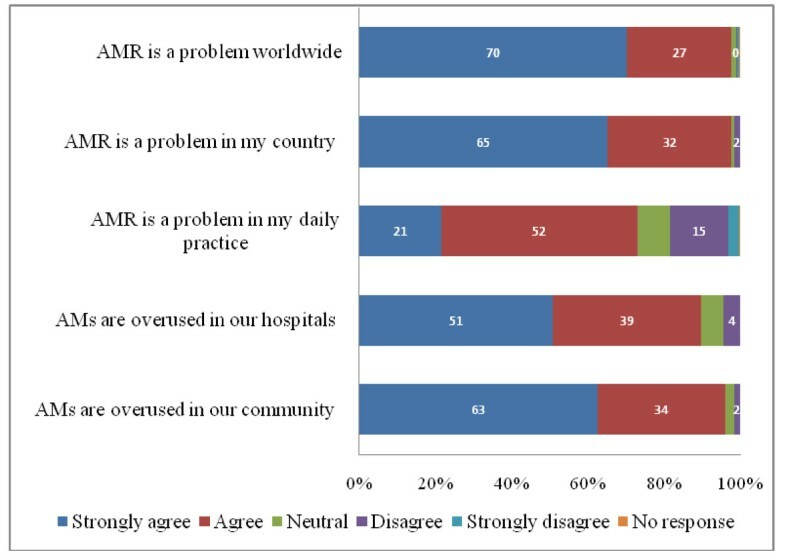 On the other hand, qualitative research among general practitioners in the U.S. showed that most of the physicians interviewed were aware that inappropriate use of AM in their own practice contributes to increasing AMR . Interestingly, the majority of participants recognized excessive use of AMs as a factor contributing to AMR in the community, but only half did so for the hospital settings.